A service object is made of one or more named IP protocols or TCP / UDP ports and port ranges, or a combination of all. For example, the HTTP version of the Smoothwall administration user interface uses TCP port 81, while the HTTPS version uses TCP port 441; you can either create a service object for each individual instance, or have one service object containing both port numbers. Furthermore, you can combine multiple service objects into a service object group. You can create and edit service objects for use throughout the Smoothwall firewall configuration. Where allowed, using service objects significantly reduces the amount of time taken to configure various aspects of your firewall. For example, if multiple firewall rules are required for RADIUS traffic, you can reduce duplication by creating a service object containing the port numbers used by RADIUS which is used by multiple rules, rather than having duplicate rules for the same port number, which is further duplicated by the number of rules required. 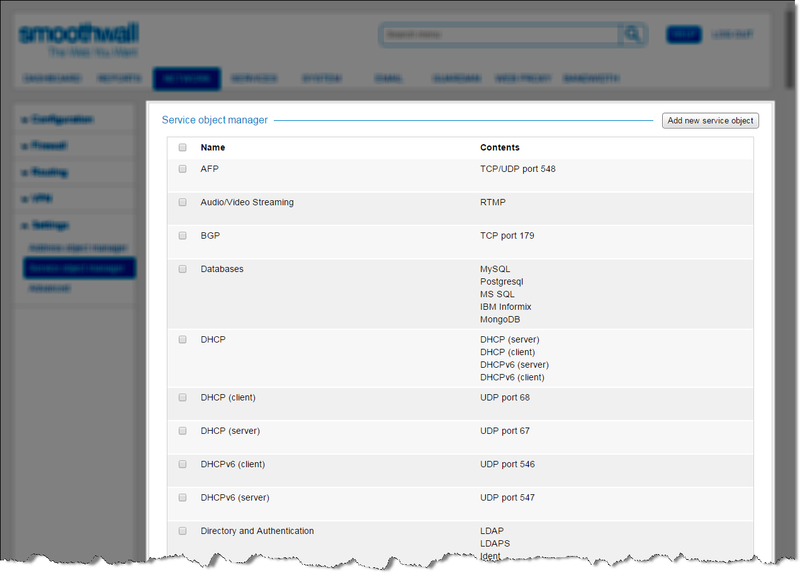 A number of default service objects and service object groups are made available for use in the Network > Settings > Service object manager page. When creating new service objects, it is important to make the distinction between a service object and object group. It is recommended you keep the contents of service objects to protocols and port numbers, that is, those that provide a service, whereas service object groups contain named service objects. 1. Go to Network > Settings > Service object manager. 2. Click Add new service object. 3. Configure a meaningful Name for the new service object. 4. If this service object contains port addresses, select the relevant protocol from Add new service. a. Add the port addresses underneath. The protocol and port number appears in Selected services. 5. If an object was mistakenly added, click for that object. 6. If required, configured an optional Comment describing this service. 3. Configure a meaningful Name for the new service object group. 4. Do not select a protocol from Add new service. 5. Click the down arrow for Selected services to view those service objects available for grouping. 6. Select those relevant service objects. 7. If an object was mistakenly added, click for that object. 8. If required, configured an optional Comment describing this object group.  From the Services field, you have clicked Create. 1. From the Add new service object dialog, select a Type of New service. 2. Configure a meaningful Name for this service object. Add the TCP port number or port number range in Port. Add the UDP port number or port number range in Port. Add the port number or port number range in Port. • Custom IP protocol number — The IP number used in the Protocol header field of an IPv4 packet. The most commonly used IP protocol numbers are defined as service objects by default. If required, you can add additional IP numbers that may be used by your firewall. Add the IP protocol number to IP number. 4. If required, configured an optional Comment describing this service object. You are returned to the Add <type> rule dialog. Note: You cannot edit or delete existing service objects from the Add <type> rule dialog. You can only do these from the Network > Settings > Service object manager page. 1. From the Add new service object dialog, select a Type of New service group. 2. Configure a meaningful Name for this service object group. 3. From Services, select the relevant service objects for this group. 6. If required, configured an optional Comment describing this service object. 2. From the Service object manger table, highlight the relevant service. 4. Adjust the configuration as required. For a detailed description of each setting, see Working with Service Objects. 2. From the Service object manager table, locate and highlight the service. Note: If your Smoothwall is part of a centrally managed solution (see Setting up a Centrally Managed System), it should be noted that any service objects or service object groups you create on the parent node are replicated to the child nodes in addition to their own service object configuration. These are prefixed with Replicated: in the relevant user interface pages.